How to write on NTFS format partition in Ubuntu? NTFS is Windows NT File System format. It has more performance, reliability, and compatibility not found in the FAT file system. For default, Ubuntu doesn’t support NTFS format. How can I write on NTFS format disks? If you are using Ubuntu Feisty (7.04), you can’t read or write on NTFS format. You have to download the additional package for this function. These installation packages are ‘ntfs-3g‘ and ‘ntfs-config‘. Need to get 146kB of archives. After unpacking 754kB of additional disk space will be used. Selecting previously deselected package fuse-utils. Selecting previously deselected package ntfs-3g. Selecting previously deselected package ntfs-config. Users from ‘fuse’ group can now mount NTFS volume. After the installation process is done, a setting menu will occur. You can choose to enable the ‘write’ function. You can change the configuration from ‘ntfs-config’ screen. Open menu ‘Application > System Tools > NTFS Configuration Tool‘. After ‘ntfs-config’ screen is displayed, select partition that you want to configure and click on ‘Apply‘. Then when NTFS write support configuration tool displayed, choose both ‘Enable write support for internal device‘ and ‘Disable write support for external device‘. You will be able to write data on NTFS format disk (internal hard disk and shared data in windows network). If you enable it, sometimes your USB External Hard disk will not be recognized by Ubuntu. Actually, this is the problem that I got in the moment (I use external HD Maxtor One Touch 100GB). When I wrote this article, I haven’t do googling yet to find the solution. So, please write comments if you find the solution earlier than me. Samba can act as Domain Controller. It will centralize the Authorization and Authentication services. hosts allow = 192.168.0.0/24 127. If you have clients that still use Windows, you have to set the ‘encrypt passwords = no’ because Windows only can access the plain password from Samba Server. That’s why, I put the encrypt password into different share-directories. If it’s accessed by Linux the I set encrypt passwords = yes and it’s accessed by Windows Clients then I set encrypt passwords = no. Now, let’s check our configuration. When you use smbclient, just don’t put ‘sudo’, it will create an error like above. Now, I repeat the command without ‘sudo‘. This command is used to check sharing directories in Samba Servers. Smbclient is almost the like ftp program. It’s used to access SMB resources on the servers. After you are connected, you can browse, add, delete files or directories. Of course, it will be depended on your access level. You can use common Linux command line, such as cp, mv, mkdir, rm, rmdir, ls etc..
Well, you’ve done the 4 practices. Now, we can go further with our lesson. Samba need port 137 and 139 for the connection. If you are using Firewall application (Such as Firestarter, smoothwall or others), please make sure that you enable this port. Usually, every firewall applications block these ports as a default. If you are using Iptables and you want to open this ports, you can see my article about setting ports using Iptables. For example, you want to create a directory for training_modules and only 5 persons can access and modify that directory. First you create the training_modules directory, Second add the configuration at smb.conf and restart the Samba Server and the Third, don’t forget to add the user to Samba Server User List (Practice 3, part 2). The current version of free Virtual Box still doesn’t give a support for access your USB. But you can make a trick. 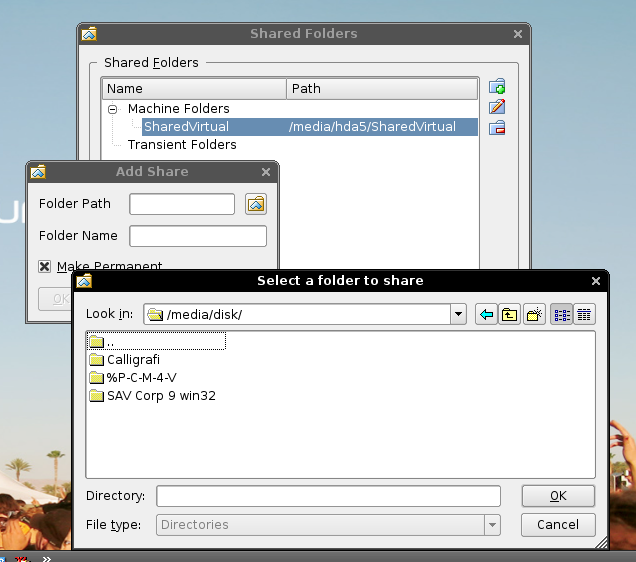 Just use the ‘Shared Folder’ to mount your USB to your VirtualBox. 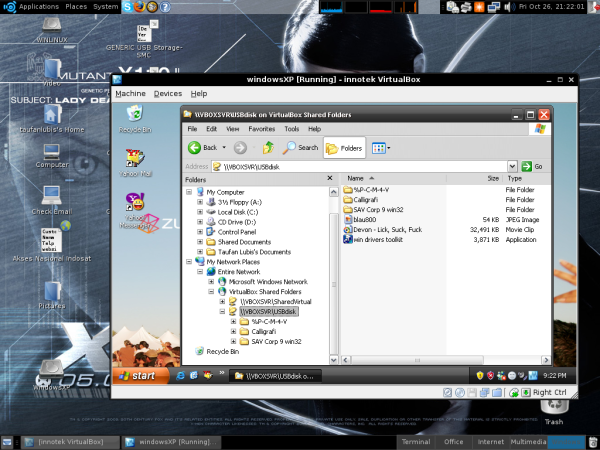 So, you can access the USB from both your Ubuntu and your other OS in the VirtualBox at the same time. If you are searching a good tool to download videos from YouTube, I think PyTube will be suitable to your expectation. You can convert the videos directly to various selected formats. What you need to run PyTube? PyTube need GTK+ version 2.12.x to run. But, don’t worry, you don’t have to think about that stuff. For Ubuntu users, choose file: pytube_0.0.8.1-1_all.deb. Selecting previously deselected package pytube. Package ffmpeg2theora is not installed. Package vorbis-tools is not installed. Package mplayer is not installed. Package mencoder is not installed. Package youtube-dl is not installed. Just ignore that error and continue our process. Add option ‘-f’, it will attempt to continue the process if the integrity check fails . 0 upgraded, 6 newly installed, 0 to remove and 2 not upgraded. Need to get 7425kB of archives. After unpacking 19.1MB of additional disk space will be used. Selecting previously deselected package ffmpeg2theora. Selecting previously deselected package vorbis-tools. Selecting previously deselected package mplayer-skins. Selecting previously deselected package mplayer. Selecting previously deselected package mencoder. Selecting previously deselected package youtube-dl. After the installation process is completed, PyTube will be placed in ‘Sound & Video’ menu list as default. Open Webbrowser (Firefox), type: www.youtube.com (note: You must have Flash ready to display the videos). Choose any video that you want to download. Copy the link and past into URL video link text box. Click ‘Execute’ button to start. Samba is the same like NFS which is used to share files and printers in Linux. Not like NFS, Samba implements SMB (Server Message Block) network protocol so it can be used for windows networking. In Windows and OS/2, they name it CIFS (Common Internet File System). Future versions of Samba will incorporate Kerberos support for stronger authentication, as well as better integration with existing Windows. NFS is ‘Native’ to Linux, Solaris and Mac OS and much more to ‘Unix’ way of sharing files. If you want to use NFS, use NFS version 3 or better. NFS version 2 or older will have some issues with file sizes. It can use to replace a very expensive, unstable Windows servers. Samba can replicate nearly all of Windows Server functionally. It appears in the Network Neighborhood like any other Windows machine and function in the same way. And perhaps, some server on your network right now could be running Samba instead of Windows and no want would ever notice. The forforming is over Microsoft Windows Server 2000. Reliable. (No malfunctions except if you have problem with the hardware). Customizable. (You can set from a simple printer server to complex Windows Domain Contoller). Secure. (No security holes known in current release). Integrated into existing network. (Very rare compability problems). a server that understands and can reply to Net BIOS over IP name service requests, like those produced by SMB/CIFS clients such as Windows 95/98/ME, Windows NT, Windows 2000, Windows XP and LanManager clients. It also participates in the browsing protocols which make up the Windows “Network Neighborhood” view. Other additional program are smbclient, smbpasswd etc. When you don’t need samba? Access shared folders, drives and printers on Windows computer. Mean you are a client to windows server. You just need a smbfs Plugin. – Sharing files among Linux, just use NFS service. – Sharing printer among Linux, just use remote lpd. – Share you printer on network with Windows computer, just use CUPS. – Sharing directories between 2 Linux computers, just use NFS or setup a FTP server on one computer and a FTP client to the other computer. If everything, can be done without Samba then why we still need it? If you have a Linux server with Windows clients and you want them to go to the Authorization process first before they can access your server directories or printers then you need Samba. samba is already the newest version. If you have Samba installed already in your system then the message will be same like above. Always make a back up when you change a configuration file. Now you have a back up already, then you can continue to change the smb.conf. Delete all content and replace with the configuration below. I create a simple configuration for our practice. – Practice 4: Primary Domain Controller (Provide center Authorization and Authentication for directories). Before we start, better we create a directory for our shared-directory. In this sample, I will put our directory in home/ directory. Change the permission so it can be read, written and deleted from client computers (only ‘group’ can delete files not everybody(other)). You can copy any data into sharing_data directory for practice. After that, edit samba configuration file, delete the content and replace with our new configuration. Save the file and restart the Samba server. To test our practice, connect to Samba server with any web browser using command ‘smb://192.168.0.2‘ (in Linux). When I open my Samba server from OpenSuse10 using Konqueror (you can use any web browser or file manager), I can see the ‘sharing_data’ directory displayed on the screen. I can browse the directory but when I save a file in it, I get a message says ‘Access Denied. Could not write to smb://192.168.0.2/sharing_data/testingfile.odt‘. Mean, that our configuration is working. If you can access your ‘sharing_data’ directory mean you’ve completed our first practice. This configuration says that you want to share ‘/home/sharing_data’ directory in the network. It’s only available from IP addresses 192.168.0.1 to 192.168.0.254. It is read only but browseable. Only computers in this IP range can open the directory. It is writeable and browseable. The different with Sample 1 is only change the Read Only in [sharing_data] from ‘yes‘ to ‘no‘. If you can save a file in this directory, you’ve completed our second practice. First you have to create an account for ‘angela’. It will create an ‘amanda/’ directory in ‘home/’ directory. Click ‘OK‘, then close the screen. Copy some files into home/amanda/ for practice. Part 2. Add the usename into Samba server user List. Without register to Samba server, amanda will not entitle to access her directory. If you see the configuration above, I moved the ‘security = share’ from [global] into [sharing_data] and [amanda]. So, each directory will has their own security access level. Amanda can access her directory after entering her username and password. type: smb://amanda@192.168.0.2/Amanda directly on the Konqueror or Firefox textbox location then enter her username and password. Continue to part 2 …. nmap is a powerfull scanner available in Unix/Linux system. It’s very usefull for network exploration and security auditing. It was designed to rapidly scan large networks, although it works fine againts single hosts. It’s very easy to install nmap in Ubuntu, just download from the internet. In this practice, I used 2 computer. I run nmap from Ubuntu to scan PC-01. Host 192.168.0.2 appears to be up. Host 192.168.0.3 appears to be up. For 40 ports, it took almost 25 seconds, so it will take much longer if you want to scan from 1-65535 (all ports in a computers). OS detection performed. Please report any incorrect results at http://insecure.org/nmap/submit/ . If you want to make faster scan, use -T4 option on nmap command..
OS and Service detection performed. Please report any incorrect results at http://insecure.org/nmap/submit/ . Now, you only need 58,83 seconds compare to 94.94 seconds (without -T4 option). For more details, just open the nmap manual. 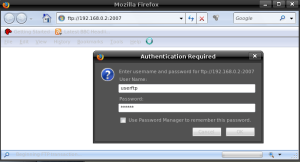 FTP (File Transfer Protocol) is a program to exchange files between two computers or to other computers in a local network or over inter networks (internet). May be you don’t know that you’ve already used it before when you download something from the internet. 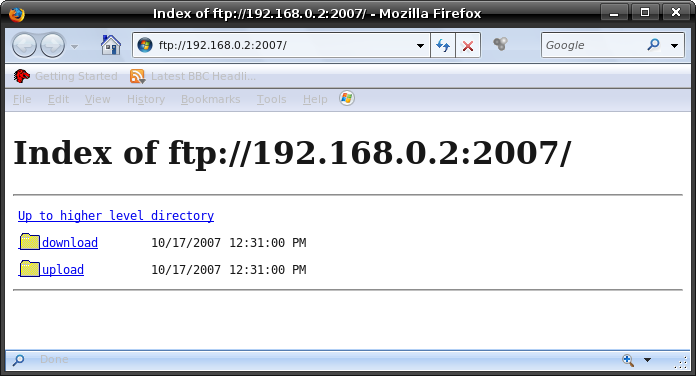 Most often, a computer with a FTP address is dedicated to receive a FTP connection. Ftp site is the like old Filling cabinets where you put your datas in it. Organized and labeled so it will easier next time you or any one who need the files can take it back next time. That concept is applied in ftp sites. You can take any files that you want to download based access level provided. The Administrator can set which files to keep locked and which open to public. Ftp server is a machine that serves the authorized users to get the requested files. The FTP file sharing protocol is an old protocol which was created when internet was still a secure place. That’s why the default FTP protocol is not that secure. Mean that your username and password for login are transmitted in plain text, well… which is not secure for sure. There are several configurations that you can set for your proftpd server. In this article, I want to show you how you can create a ftp server in a short time. In this practice, I use ‘proftpd’ as our ftp server. The file is not too big and it’s not difficult to install. Need to get 784kB of archives. After unpacking 2331kB of additional disk space will be used. Selecting previously deselected package proftpd. Not creating home directory `/var/run/proftpd’. ProFTPd warning: cannot start neither in standalone nor in inetd/xinetd mode. Check your configuration. This error occurs because we haven’t set the configuration file yet. For this practice, I create ftp_shared directory at home/ directory. Then I create 2 more directories inside ftp_shared directory. Just add a user from ‘Users and Groups’ Ubuntu menu. System > Administration > Users and Groups then just click Add user. The final preparation is configure your proftpd server. The proftpd configuration file is located at /etc/proftpd/proftpd.conf. Always create a back before you change any configuration files. Replace the content with our new configuration data. Save the edited file and restart the FTP server. Now, you have your own ftp server already. You can test it using FileZilla or Firefox (any web browsers). Type: ftp://192.168.0.2:2007 in your firefox Url box.